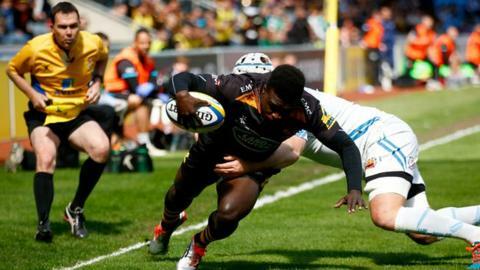 Wasps improved their hopes of a Premiership top-six finish at the expense of play-off rival Exeter by beating the Chiefs at the Ricoh Arena. After Will Chudley cancelled out Wasps winger Christian Wade's early try, the home side led 26-16 at the break thanks to a penalty try, aided by the first three of Andy Goode's four penalties. Premiership top try scorer Thomas Waldrom crossed on the hour for Exeter. But Wasps scrum-half Joe Simpson's late breakaway try finished off the Chiefs. Following an earlier haul of 16 points from the boot of Henry Slade, Gareth Steenson's late drop goal did at least earn the visitors a losing bonus point, to keep them within three points of third-placed Saracens. But Wasps' veteran stand-off Goode again took individual kicking honours with an 18-point haul, from three conversions and four penalties. Coventry-born Andy Goode's haul with the boot brought up a century of points for him at the Ricoh Arena, in only seven appearances on his 'home ground' for the Coventry City fan. That took him past an individual century of points at the Ricoh as Wasps took a giant stride towards joining Exeter in next season's European Champions Cup. Despite winning, Wasps remain sixth but, with two games to go they are now within two points of fifth-placed Exeter - and just five behind third-place Saracens as the battle for a top four play-off place hots up. Wasps were ahead after only 70 seconds when, from a scrum 15 metres out, number eight Nathan Hughes picked up and drew in two defenders to provide Wade with a simple, converted try. Within three minutes, Exeter were level when Chudley saw a gap in the defence to race 15 metres to score, Slade converting. After an exchange of penalties, Exeter remained in contention until Waldrom was harshly yellow-carded for a deliberate knock-on, a decision that quickly proved crucial when Wasps earned a penalty try, which Goode converted for a 26-16 half-time lead. Waldrom then forced his way over from close range for his 14th Premiership try of the season to leave Exeter trailing 29-23 at the end of the third quarter. But, although Goode missed with a late penalty to keep the result in doubt, Simpson scored a blistering solo try to seal victory with four minutes to go. The Wasps scrum-half produced an electric burst to run 50 metres to score, Goode adding the extras before Steenson dropped a goal with the final kick of the match. "We have got one foot in the top six, but there are no easy games in the Premiership. "If we can beat Leicester next up then we can cement our place and go into the last game against London Irish and give the top four a real crack. "It was a typical Wasps performance, brilliant on occasions, but we caused ourselves no end of problems. "We were ill-disciplined in the first half and we looked to play miracle balls but we deserved to win as they came into our 22 only once in the first half." "It was a big game for us, but we were a passive and edgy team in the first half. "I am happy with the second-half effort and if we had showed the same quality in the first half, then it may have been a different story. "Games get bigger and bigger at this time of the season and I am frustrated when we don't show the qualities which we have got, as the game had nearly got away from us by half-time." Wasps: Masi; Wade, Daly, Leiua, Tagicakibau; Goode, Simpson; Mullan, Festuccia, Cittadini, Gaskell, Myall, Johnson, Haskell (capt), Hughes. Replacements: Shervington, McIntyre, Cooper-Woolley, Cannon, Thompson, Davies, Lozowski, Miller. Exeter: McGuigan; Whitten, Nowell, Hill, Jess; Slade, Chudley; Moon, Yeandle, Francis, Mumm (capt), Lees, Ewers, Horstmann, Waldrom. Replacements: Cowan-Dickie, Rimmer, Sturgess, Welch, Johnson, Lewis, Steenson, James.